Visited with my niece and her family for Easter. Late last year they had to put down their beloved dog of many years. However, their home still showed signs of a canine presence. A feeding time schedule was still being used. What is that below the sign? Meet Bruno, a pure American mutt, who is a big and lovable soul. Cared for by my niece, her husband and two young sons. Bruno is a bit challenged but I am told he is improving. My grand nephews who you last saw with Winnie the Pooh in Walt Disney World, play with and enjoy Bruno. 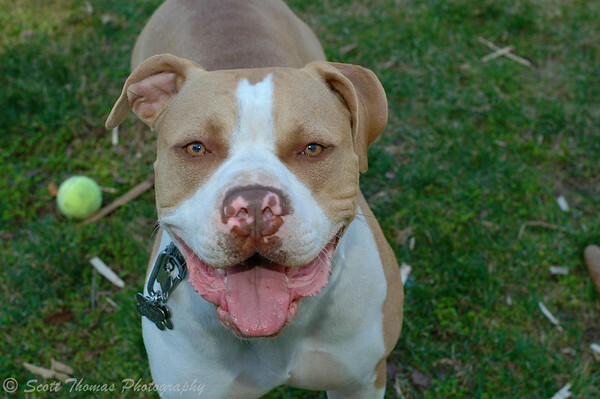 Though Bruno is much stronger than they are, he is gentle and loves to frolic with them in the backyard. This entry was posted in Animals, Weekly View and tagged 50mm, american, breed, canine, disney, dog, family, home, mixed, mutt, nikon D70, pets, Photography. Bookmark the permalink. Miss Sadie and the Cowboy wish to congratulate Bruno and his new family. 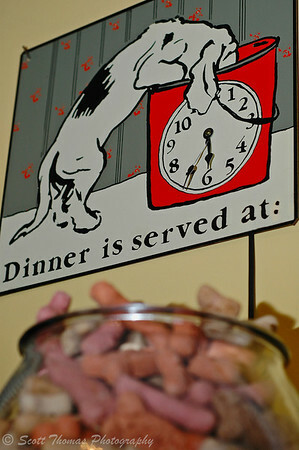 The also wish to know where they might acquire such a ready supply of treats, not to mention the handy reminder that it is dinnertime. I will pass on their congratulations to Bruno the next time I see him. 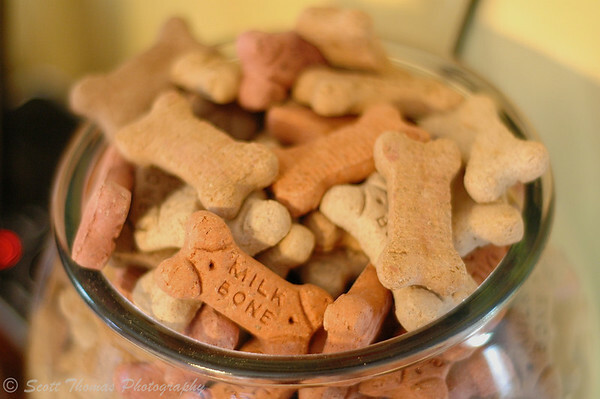 Love the milk bone shots !!! Great picture of the doggie (Bruno) too !!!!!! Love It!!! What a great doggie “smile” shot! You say he’s a great American mutt, but I think he’s got more than a little pit bull terrier in him from the shape of his face. A strong and stubborn breed, but I’m sure he will be a great family friend now that he’s in a happy home. Not only “In” a perfect world, that might make a more perfect world! I love any photos about dogs. Bruno looks like a lucky fellow to me. Sounds as if there is plenty of love to go around for the guy. That’s some dog ya got there Scott. Looks like a really happy guy. I love the first photo. Nice. Look at Bruno smiling at the camera, he is beautiful. I know my house doesn’t feel like a home without a dog.